In a 2011 letter to a school district, California’s then-Attorney General Kamala Harris decried “the practice of artificially inflating the interest rate” to obtain “additional bond proceeds over and above what the voters authorized.” If only she had known that this practice is subsidized by the federal tax code! This costly and seemingly inadvertent subsidy is discussed in my forthcoming paper titled Tax distortions and bond issue pricing. The paper does not contain any policy proposals, but in this companion article I propose a couple of ways to eliminate the subsidy. The histogram of issue prices of U.S. Treasury bonds looks like a candlestick: all bonds are issued with a tiny discount to face value (if face value is normalized to 100, a typical list of auction prices will be 99.9, 99.75, 99.82, …).1 Corporate bond prices are equally boring. Taxable municipal bonds? A little more scattered, but still solidly anchored around 100. The one weird trick I would suggest would be to disallow capital losses for tax-exempt bonds issued at premium, unless the price drops below par. For instance, if a bond is issued at 120 and the next day it’s sold at 95, the capital loss is not 120 – 95 = 25, but rather 100 – 95 = 5. The rationale for this approach should become clear soon. If this measure were adopted retroactively (i.e., if it were to apply to losses on bonds already in circulation), substantial savings would likely begin to be felt within the 10-year budget window, especially if interest rates rise. If retroactive adoption is not an option, savings would take longer to materialize, but they could perhaps still help down the road. A simpler and less weird alternative would be to ban premium tax-exempt bonds altogether. The U.S. Treasury and for-profit corporations almost never issue premium bonds, and it would be easy to argue that there is no good business reason to issue them.3 In fact, the U.S. Treasury has banned premium municipal bonds in the past–except that the ban only applied to Build America Bonds, which are taxable.4 I personally do not recall the reason, but hey, there are many good reasons to ban premium bonds. (Some of them are described at the end of the article). A drawback of this approach, however, is that it cannot be made retroactive because the bonds already in circulation cannot be un-issued. To see why, let’s begin by examining the case in which Alice and Bob buy two similar bonds issued at par (i.e., they pay 100 to the issuer). After a short amount of time ε the bond prices drop to 90. If Alice and Bob were to simply sit on their bonds until maturity, they would never realize any gain or loss, and because the interest from the bonds is tax-exempt, they would never pay any taxes. 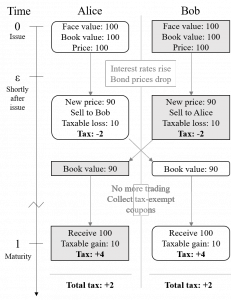 Instead of sitting on their bonds, however, Alice and Bob agree to a taxable swap: each will sell their bond at a fair market value to the other. As a result, their portfolios will be practically unchanged, but both will have realized a capital loss of 10. Assume this loss is deductible at the capital gains tax rate of 20%, so that it generates an immediate benefit of 2. Upon maturity, having paid 90 for the bond, Alice and Bob receive 100 (the bond’s face value) and thereby realize a gain of 10. This gain is labeled “market discount gain” and it is taxed at the ordinary rate of 40%, so that it generates a cost of 4. The swap and its consequences are represented in the diagram below. It is not clear whether Alice and Bob gained or lost from the swap. Is it better to never pay any tax, or is it better to get a tax rebate of 2 now, and then pay tax of 4 upon the bond’s maturity? It depends on the investors’ discount rate and on the amount of time until maturity. 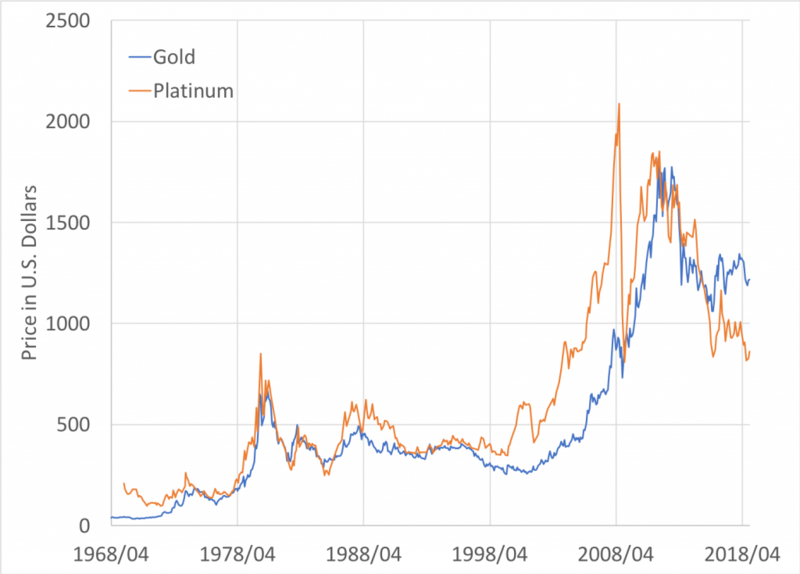 However, roughly speaking, it would take a very long time to maturity or a very high discount rate for Alice and Bob to be happy about the swap. Now consider the same exact vignette, except that the bonds are premium bonds. They are issued at 110. At time ε, their price drops to 100. Alice and Bob do the swap and get an immediate benefit of 2. Upon maturity, having paid 100 for the bonds, Alice and Bob receive 100 (the bonds’ face value) and… that’s it. There is no gain or loss. Alice and Bob receive an upfront benefit of 2 from the U.S. Treasury, and never pay any taxes since. Hence, the negative revenue. This tax arbitrage scheme works for all premium bonds, regardless of discount rate and bond maturity. Bond Swapping involves selling one bond and simultaneously purchasing another similar bond with the proceeds from the sale. Why would you engage in this practice? You may wish to take advantage of current market conditions (e.g., a change in interest rates), or perhaps a change in your own personal financial situation has now made a bond with a different tax status appealing. Bond swapping can also cause you to receive certain tax benefits. In fact, tax swapping is the most common of bond swaps. Now it should be clear what the weird trick does: disallowing losses above par directly eliminates this source of tax arbitrage and takes away the main tax incentive to issue premium bonds. Although tax arbitrage would be enough of a motivation to issue premium bonds, there are other plausible explanations for their issuance. Hilariously, these alternative explanations also involve some sort of gimmick. Cleveland Fed economists Whitaker and Ergungor argue that premium bonds are issued as a workaround to self-imposed debt limits. Debt limit rules appear to be unaffected by the GASB 34 requirement of accrual accounting, and therefore a premium bond issued at 120 contributes only 100 towards the debt limit. So far this gimmick has only been used by local issuers like the school district mentioned at the top of this article, but in principle it could be used by the federal government as well: Matt Levine proposed issuing premium bonds as a workaround to the United States debt ceiling problem. This factor may explain why relatively many taxable municipal bonds are issued at a premium (10% in 2015) compared to other taxable bonds (less than 1%). 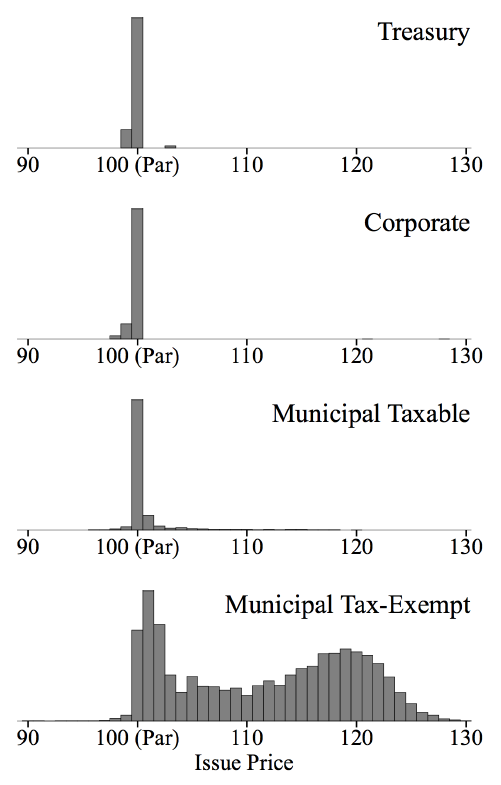 However, this factor does not depend on the bonds’ tax status, and therefore it cannot explain why, in the municipal market, tax-exempt bonds are overwhelmingly more likely to be issued at a premium (85%). Similarly, Andy Kalotay argued that, for callable bonds, a premium issue price creates illusory savings from exercising the refunding option. Many issuers have self-imposed restrictions to the effect that a bond can be called only if the refunding achieves a certain savings threshold. However, refundings can serve as yet another way around borrowing limits. Illusory savings from the refunding of premium bonds fit the legal definition of savings and help get around the restrictions.6 This factor, too, may enhance state and local governments’ incentive to issue premium bonds. However, by definition it only applies to callable bonds. In reality, noncallable bonds are issued at a premium more frequently than callable bonds (94% versus 64% in 2015). These additional “creative accounting” motives for the issuance of premium bonds are important, but they are not mutually exclusive with the tax arbitrage motive I highlight in my paper. Rather, they are complementary. The tax code contains a loophole that subsidizes the issuance of premium bonds, and this loophole rewards lack of fiscal discipline at the state and local level.